Filet Mignon – How to Cut Your Own ! 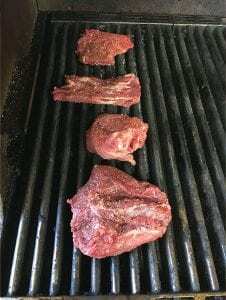 The prized cut for any beef lover is and always has been the filet. One rule for any source of protein is the more weight the muscle carries or the more it is used by the animal, the tougher the cut is. That’s not to say it is impossible to make such muscle groups pull apart good. They just require different cooking methods but that is for another day. 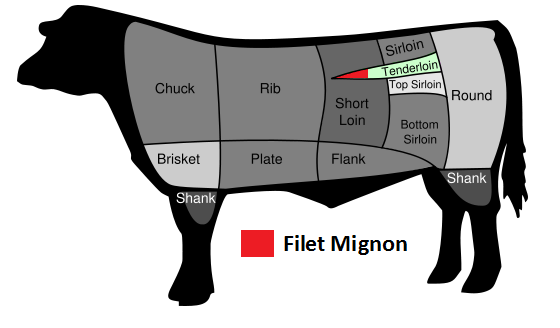 The Filet Mignon is the most tender piece of meat on the bovine because it’s not a weight baring muscle. Our focus will be looking at the PSMO or Primal. 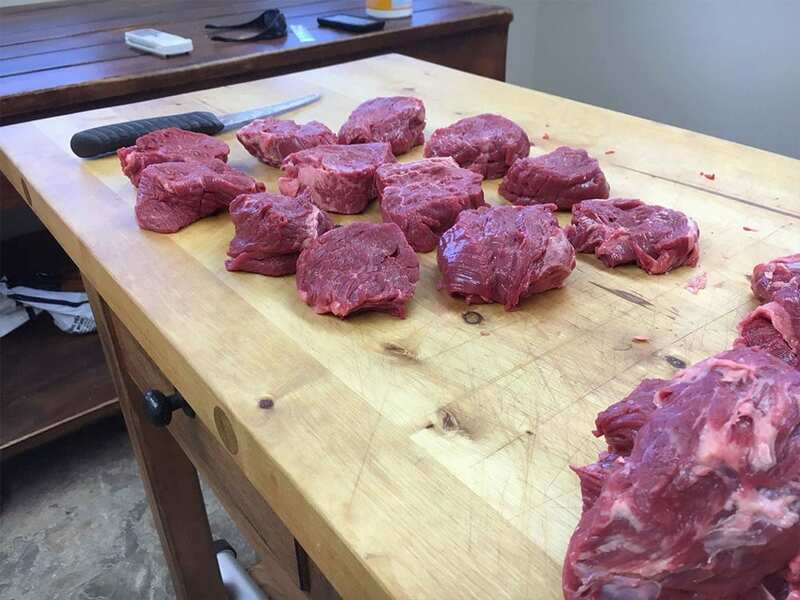 This is where those little round bundles known as the filet live. This is an expensive piece of meat for its size being the crown jewel of every steakhouse or ritzy restaurant across the country. Cutting your own will bring some serious appeal at the next dinner party! 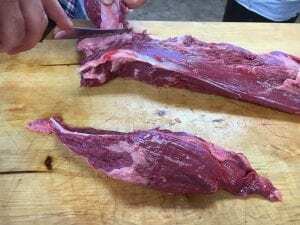 The muscle refereed by the butcher as the PSMO or Primal are what Filet Mignon are cut from. Primal are packaged in heavy cryo-vac to help protect them during transportation. This is what the PSMO looks like when it comes out of the cryo-vac. Take your time when trimming, like many things, doing thorough prep work will result in the best end product. After trimming, use a sharp kitchen knife to cut along the seam that is located between the head and the main part of the PSMO. This will separate the head. 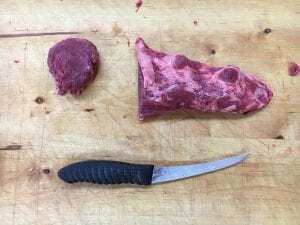 The head can generally be cut into 2 6-8oz Filet Mignon. 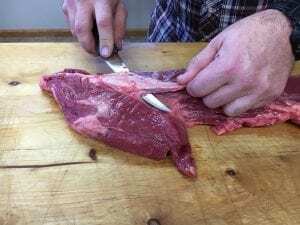 Be sure to use a sharp knife and keep as much meat as possible, but remove all the fat and connective tissues! 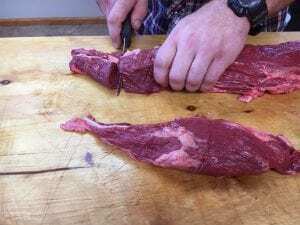 The more time spent trimming the better the filet will look in the end! 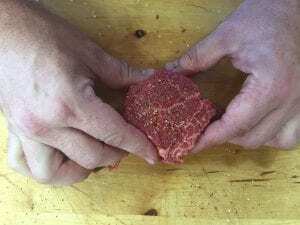 “Square up” the head end of the main part of the PSMO, from there, decide how thick you want your Filet – 1.75″ – 2″ thick is a nice rule of thumb. Trimming off the head of the PSMO. Allows for a uniform cut and better presentation. Always make sure you cut across the grain, just like slicing a loaf of bread, but make the slices thicker. 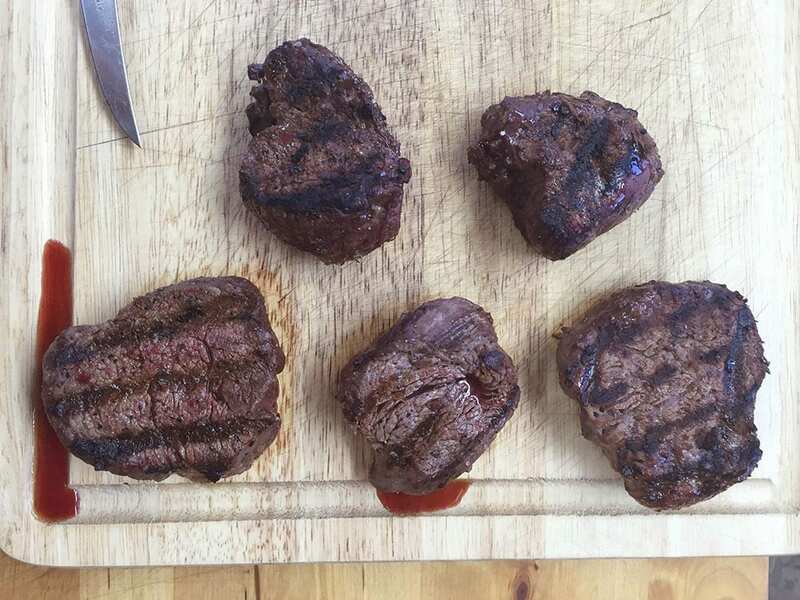 1 PSMO = 12 Filet (6-8oz) 1 lb. of waste trim, and 1 lb. of lean trim. 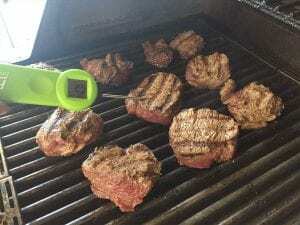 If you do the math, and know where to buy a primal, you can save some money cutting your own steaks. We raise our beef without antibiotics, growth hormones or any of the other things that reduce cost. 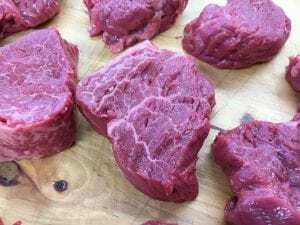 Cutting, packaging, freezing and storing is also very costly, but the convenience of being able to order perfectly grown and cut steaks is worth the extra charge. 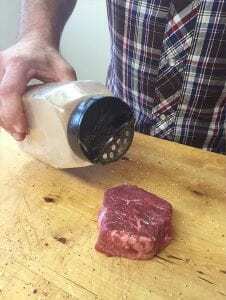 A perfectly seasoned, Center Cut Filet Mignon. 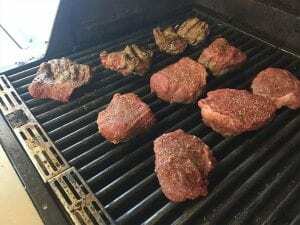 The center cut steaks are the classic looking filet. We recommend cutting a minimum of 1.5″ thick and we cut them up to 3.5″ for our King Cut line. (King Cut is a 16oz Filet) Make sure to trim any remaining connective tissue, there won’t be much at this point. 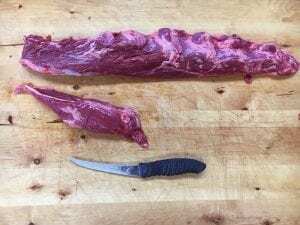 The PSMO yields 6 center cut Filet. 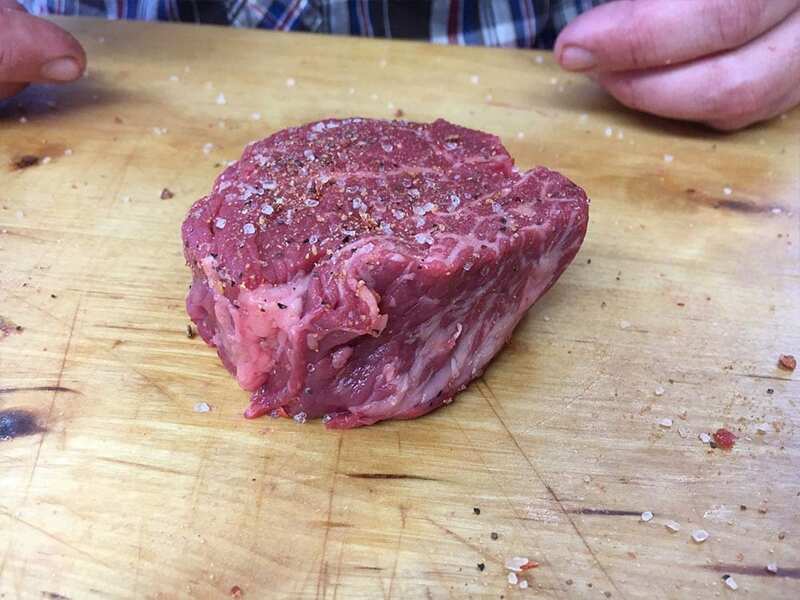 Remember – there are only 2 PSMOs on each head of beef that means every beef that’s processed only yields about 12 center cut Filet Mignon steaks…that, my friends, is why these babies are pricey. 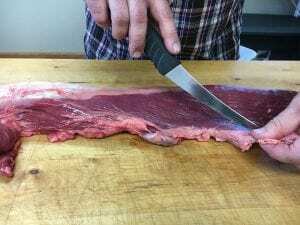 Getting thru the last “center cut” Filet from the PSMO, we move into what is called the tail section of the primal. 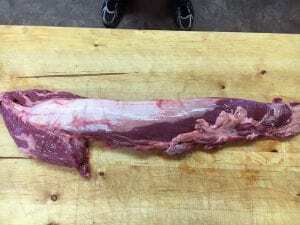 The tail can be cut much like the other end of the PSMO and rolled, wrapped with bacon and pinned with toothpicks. The other option, is to season and grill it just like it is, that’s what we did. Form tail pieces into a medallion for easier cooking and uniform look! There are A LOT of Old Wives Tales about how to cook a perfect steak. The one fact common to all is that they are Old Wives Tales. Remember thicker cuts , low and slow! The filet is a cut that can be intimidating for its expense as well as its expectations for flavor by all. The one important point to consider is the filet will make you look good all on its own. 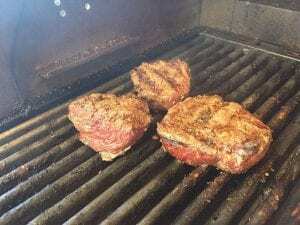 Filet require little to no seasoning, wrap in bacon or don’t wrap in bacon and side dishes can be as simple as green beans, potatoes all the way up to lobster tails. Most of your guest won’t care, the simple fact that there is a big fat filet sitting on their plate will be enough to keep them talking for weeks to come. Stay to the basics while on the grill or in the oven. This is not a time to experiment! The grill isn’t ideal for consistent results. Try the sear and oven techniques on some lesser cuts like a sirloin or strip and move up to your fillet.